Last Friday we held our successful Jobs Fair, this year in the Rhymney part of our constituency, and it was good to work with local businesses and organisations to talk about local job and training opportunities. Thanks to those who attended the event. 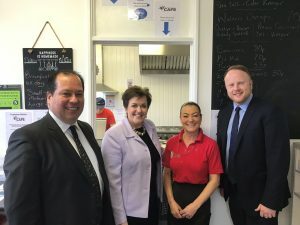 We followed up the Jobs Fair with a visit to a new small business in Rhymney – the Victoria House café. We offer our best wishes to Lisa with her new venture and it is great to see a new business start-up thriving in the area. Read more here about the new café. 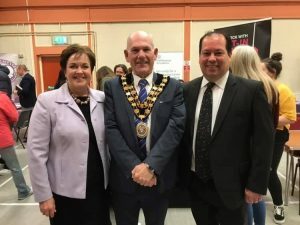 The Jobs Fair also marked the launch of a new piece of work that we will carry out in the coming months on the Local Economy and Jobs in Merthyr Tydfil and Rhymney. We want to hold yet more conversations with local employers, businesses and their staff about how we can protect and develop the local economy. We know that the local economy and jobs are always a high priority for our constituents, and we will focus more time on these issues in the months ahead. 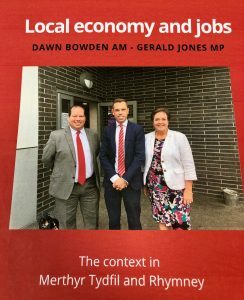 So to help start the discussion we are today publishing a report on “Local economy and jobs – the context in Merthyr Tydfil and Rhymney”. We are distributing copies to local contacts and you can read a copy here. While some of the forecasts it contains are a cause of concern, we know that our responsibility is to work with partners across both the constituency and the wider region to identify each new opportunity for improving skills and providing jobs. Let us know if you would like to host a visit and let us together show the optimism that can help sustain our local economy as we move forwards. This project will run from now until the Autumn so there is plenty of time to get in touch, to get involved and share ideas about the future of our local economy and jobs.